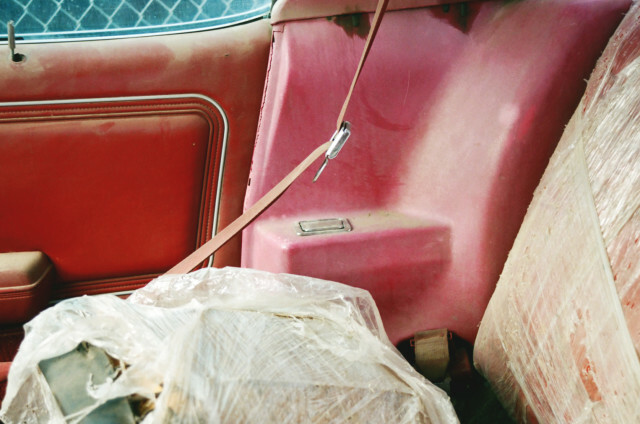 Strangeness and familiarity come together in the photographs of Canadian-British Lorena Lohr. Travelling around the American Southwest by train, Greyhound bus and on foot periodically since 2010, her journey through nameless streets and forgotten highways is documented in the ongoing series ‘Ocean Sands’. Fleeting landscapes and unexpected moments stand still as she passes through each new place, caught in her pictures of the bars, motels and suburban houses that she encounters. The experience of the unknown, together with the heightened sensations of both wonderment and fear that come with it, is embraced in Lohr’s focus on the neglected interiors and faded facades that populate much of America. By casting her eye on their overlooked details, she shows what it means to see even the most ubiquitous of spaces with unfamiliar eyes, serving as a continual reminder of her own status as a visitor. Lohr travels alone, and her pictures are – for the most part – devoid of people. Instead, an alternative portrait of the individuals who populate these spaces is built up through the traces that they leave behind. The chair recently vacated, the half-finished drink, the empty driveway or the back door left ajar. The more deliberate markers and signs that remain within a place also intrigue Lohr. Representations of palm trees, galloping horses, seashells, dramatic sunsets and birds of paradise appear on motel and cocktail bar fronts and painted wall murals, sun- bleached memorabilia, carpeted floors and furnishings. Recurring motifs in her study of the layered histories of vernacular space, they suggest at once the allure of the exotic and the sadness of unfulfilled dreams. An undercurrent of desire, aspiration and loneliness emerges, as fantasy and reality intermingle in her framing of surfaces and textures. This escapism also characterises Lohr’s interest in language, and particularly the text used on signage. Shown isolated on blank streets and deserted corners, they are situated in contrast to the visions that such phrases as ‘Spice of Night’, ‘Casablanca Crystal Room’ and ‘Ocean Sands’ (from which Lohr’s photo series takes its title) aim to evoke. The phrases that fascinate Lohr are typically generic, simple in their wording and brash in their sentiment. Disconnected from the context of a specific time or place, they become representative of a more universal vocabulary of hope, longing and isolation as they appear and reappear throughout Lohr’s photographic work. The influence of the written word is further apparent in Lohr’s self-published booklets, each titled with phrases taken from her journeys. Images are edited into sequence and placed within clearly defined collections, allowing for immediate visual connections to be drawn between them page-by-page. The act of self-publishing is also interrogated by Lohr as a method for distribution and discussion. From 2011 to 2013, she printed regular photo zines that were mailed to a list of subscribers from around the world. The personal presence of Lohr herself is important in these interactions; zines and individual prints are signed or stamped with lipstick, while booklets published since 2013 are given out by hand to friends and strangers alike. The distribution, like the initial production, of Lohr’s photographs is borne out of an immersive experience. Working with 35mm colour film and a variety of compact and inexpensive cameras, Lohr upholds her interest in the DIY ethos that guides much of her work. Analogue C or Chromogenic prints produced by Lohr in the darkroom in limited editions extend this further, resulting in a sense of immediacy created as much in format as in subject. Her study of the interior life of place has recently continued in parts of Europe. By widening her focus beyond America, she emphasises the shared gestures of human relationships and solitude that invariably mark streets, bars and private homes. Together these images tell the passing tales of people and the spaces that they inhabit, embodying the frustration, romance, banality and optimism that they lay bare.